It’s been a while since we’ve heard from our buddy Yosiell Lorenzo, the artist behind the “Sicklings”. Wait no more as Yosiell presents to you, not one BUT TWO releases! Amanita Mushroom Sickling release. 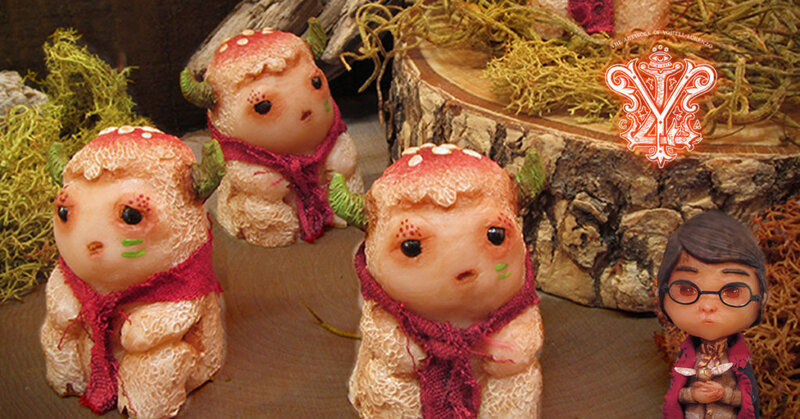 The first figures are 3″ Sicklings based on the poisonous mushroom, the Amanita. They are an edition of 5 and come with their own mossy skull, the set will go for $80. The second Sicklings are 2″ Strawberry top minis. These are an edition of 4 and come with little red cloaks and will run for $30. All the pieces are signed and numbered, hand cast resin and painted. Orphan resin bust based on Harry Potter, he is 6″ resin cast and hand painted with his school colours. He comes with his wand, Marauders map, potion books and a snitch. He is one of a kind and will run for $180. As a young child in the New England area, Yosiell was surrounded with the stories of Salem witches, old colonial haunted houses, and authentic Victorian architecture. His work draws inspiration from these early influences, reflecting the darker elements of the human condition and the mysteries of the supernatural world. Yosiell’s work incorporates a variety of textures, often using the palette of earth tones or dark colors. He works in varying mediums including sculpture, painting, ink and digital art. You can catch Yosiell via http://www.sicklings.com/ Twitter , Facebook and Instagram.